Since photographs were first hitched to the tasks of moral suasion and political persuasion a hundred years ago, the visual rhetoric of socially-engaged photography has stood on four legs. First, observation is treated as a social act, and photographs as cultural objects with (urgent) work to do, forms of address to an audience and not just display for it. Second, showing social actuality is treated as a matter of linking––implicating––viewer and viewed as co-habitants in a shared world needing repair. To look at photographs becomes a matter of looking into them, and then reading them for the sake of doing something about what they show. Third, the socially-engaged photograph trades on the sour charms of responsibility, in which an audience’s willingness to look at suffering––to be shocked, stirred, abraded––becomes a matter of ethical cultivation, and the photograph becomes a visual embodiment of collective conscience. Finally, socially-engaged photography pivots on a confrontation with alterity, in which picturing means acknowledging and then traversing social barriers, holding opposing ideas in the mind at once (to paraphrase F. Scott Fitzgerald’s test of first-rate intelligence), bringing “light in floods” to the social perils of darkness and ignorance, in one of Lewis Hine’s favorite phrases. Several discrete traditions co-exist within this visual idiom, some reportorial, some contemplative, some propagandistic, some dispassionate, some optimistic, some tragic, some self-consciously artistic, some anti-aesthetic. A critical and historical taxonomy of socially-engaged photography has never been written––and would probably fail, inasmuch as it would mean aligning the complex ontology of the photographic image with the constantly mutating social functions of pictures, to register many forms of narrative opacity. But perhaps a simple distinction is fair, and can be identified with Jacob Riis and Lewis Hine as progenitors. Riis practiced what is now commonly called victim photography: well-meaning but condescending views of disempowered people whose affliction stems from the lack of good decisions by social and political elites. Hine spurned pity and other forms of belittling sympathy, and embraced the full human agency of those he photographed: he showed people who are wronged but not incapacitated, exploited but not deficient. His strangers are not strange, only different. Where Riis found human specimens––human objects––to learn about, Hine found human subjects to learn from. Laurence Salzmann’s latest project, Echele Ganas: A Life Left Behind, sits atop his remarkably probing and restless forty-five year career. Salzmann is Hine’s natural heir, a photographer with Hine’s instinct for human mutuality, with the same impatience for human generosity, and the same impulse to search out and pursue humanist values at social fracture points, the zones of normalized distrust. Where Hine’s focus was exclusively American, Salzmann’s has been global, from his early work in Mexico, Tlaxcalan Sketches, to his well-known work in Romania, The Last Jews of Rădăuţi, his prolonged work in Turkey, Anyos Munchos I Buenos, his essay Lithuanian Memories, his Cuban projects Imagining Cutumba and La Lucha/The Struggle, and now Echele Ganas, a photo-text-video project whose scope and ambition Hine would have admired. Echele Ganas proceeds from a not-so-casual shrug at the authority of borders, beginning with the literal border between Mexico and the United States. Salzmann’s purpose is to look sympathetically at the complications of Mexican immigration from the Mexican point of view, which is to say the point of view of an American who has taken the trouble to learn Spanish fluently, to befriend and become trusted by immigrant Mexicans living in Philadelphia, and to travel back to their home villages multiple times in order to understand how their emigration and return changes life in their native places. Or to put it differently, Salzmann begins from the question, “where does the practice of hospitality lead?” His concern is not merely to practice the easy kind of hospitality––to people one already knows––but hospitality to the stranger, specifically the scorned and stereotyped stranger, embodied in contemporary U.S. culture as the poor Spanish-speaking immigrant. Hine’s 1904-1909 Ellis Island project began from a similar premise, when the stigmatized immigrant others were Jews, Poles, Russians, Italians, Albanians and others from eastern and southern Europe. In focusing on the ways that U.S. culture and the U.S. economy impacts Mexican life, Salzmann’s perspective is precisely the reverse of the one that dominates the immigration debate in the center-right (i.e. mainstream) American media, which typically frames the issues in the reactive terms of “what they have they done to us”––“what laws of ours they have violated,” “what jobs of ours they have taken,” “what wealth of ours they have siphoned off,” etc. As a political work, Echele Ganas is not a polemical work. Salzmann does not argue what is obvious to him (and many others) through experience––namely, that the overwhelming majority of immigrants, wealthy and poor alike, bring skills, ingenuity, determination, pluck, integrity and community- mindedness to the American cities in which they live and work, and so doing, embody American ideals as much or more than Americans themselves. Likewise, Salzmann takes it as a given that questions of assimilation are for immigrants themselves to decide: immigrants are entitled to nothing less than the same self-evident truths and inalienable rights to pursue happiness as they understand it that Americans proclaim for themselves. 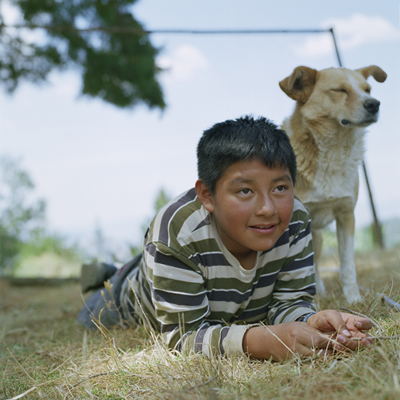 Salzmann’s subjects come from villages in the mountains of Sierra Norte in the southern Mexican state of Puebla, one of the poorest areas in the country. As with the vast majority of Mexican migrants, their reasons for leaving are economic: virtually all development in Puebla is centered on the capital city and surrounding areas, leaving a drastic economic gap between urban and rural areas. 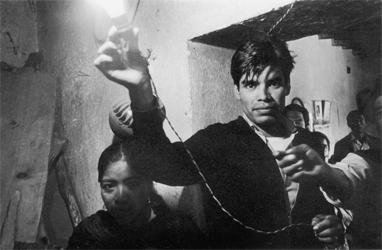 To be more specific, rural and largely indigenous Pueblans (ethnically Nahua in the areas Salzmann worked) subsist against the internal distortions of the Mexican political-economy, in which small farmers lack access to capital inputs, infrastructure and irrigation, and rural communities suffer from severe underinvestment in education, health care and social services––a nexus of disadvantage whose roots extend to the impact of the massive land appropriations of the colonial period, and reflect the deep stratifications of Mexican society historically. The proximate cause of Mexican migration is, of course, economic globalism, specifically the North American Free Trade Agreement (NAFTA). According to the Pew Hispanic Center, the Mexican- born population in the U.S. has spiked from 2.2 million in the mid-1980s, when the first of the neoliberal structural-adjustment programs were implemented in Mexico, to 12.7 million in 2010. 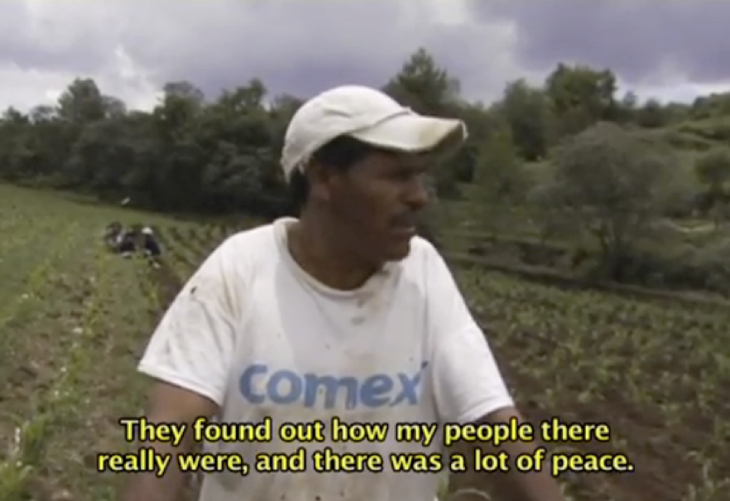 Rural Pueblans are among the millions of Mexicans who have chosen to move north in response to the “free” market policies that have pressured the Mexican state into austerity measures for social services, kept wages (attractively) low for Mexican industrial workers, and left Mexican peasant farmers unable to compete with U.S. agricultural imports (not to mention deprived them of their rights to communal lands (ejidos), which were abolished under direct U.S. pressure). Although his work is not an exposé, Salzmann understands that the influx of Mexican immigrants is the product––not the byproduct––of the advantages that NAFTA has bestowed on the U.S, and that most Mexican migration can fairly be called forced. “Illegals” are rational people making the difficult decision to uproot themselves for the sake of a small measure of opportunity across a hostile border, in the very country––our own––that has acted to (further) impoverish them at home. In the film component of Salzmann’s work, many of his interviewees testify to this effect. “It’s been about twenty years since people started going to the U.S. from here,” an old shepherd reflects. “If we had strong jobs here, why would we look for them on the other side?” asks a resident as he hauls hay by donkey. “What I was able to save there in five years,” one returnee states, “I wouldn’t be able to save here in ten years.” “There are jobs there,” another resident observes, “and what we need here is money to pay for our children’s schools...and for many other things, illnesses that begin in various places and everything else.” As he speaks, we see children in a playing field beside a bilingual rural elementary school. In one of the most eloquent segments, a sharecropper by the name of Lorenzo Vásquez––father of ten, several of whom are working in Mexico City and in the U.S.––explains to Salzmann that if Americans visited Mexico, they would find good people and good things. “Everyone is welcome,” he explains, to share in the beauty of the countryside, the tranquility, the safety, and solidarity of his home. “No one here has harmed you, right?” he asks rhetorically, and adds, “it’s beautiful when people are united to work and come and go...the ones there and the ones here.” He looks out over his corn field and asks what sense it would make to put up a fence between his village, Mirador, and the next village, Tonalapa. “It’s nice that the Tonalapa people come here, and that people from here go to Tonalapa, and that we live and drink a tequila together––that’s how we can have calmness. It’s very nice.” When two villages come to share celebrations and find out about one another, the result is “a lot of peace.” This farmer understands that what is good between villages is no less good between nations. Vásquez’s non-oppositional view of immigration, his capacity to see the benefits of mutuality and interdependence, is at the heart of the Mexican perspective. The filmic and photographic components of Echele Ganas function on complementary registers. The film that accompanies the book––also available as a set of short films online––is not a conventional documentary, in which the filmmaker uses subjects to present (or at worst, ventriloquize) a narrative that is by turns brought to and extracted from events. Partly a reflection of his training in anthropology, Salzmann’s approach is closer to ethnographic filmmaking, in which the subjects’ own feelings and experiential awarenesses structure the work’s narrative––if “narrative” is the correct word for what it is to track interlocking points of view in a sensuous filmic space, so that stories seem to rise like bubbles from a depth of human interconnectedness, imparted by people who know (and are related to) one another in many ways. “Narrative” in Salzmann’s hands is a rich and difficult proposition, filled with the unfinished, open-ended and self-searching aspects of his subjects’ realities. To my eyes, the core intelligence of Salzmann’s film is his non-didacticism, his unwillingness to forsake the suggestive for the merely explanatory, and his insistence that we respect the lifeworld of those “left behind” for what it is––a non-conclusive form of communal self- understanding that is material, practical and contemplative all at once. The photographic aspect of the work functions as a distillation of his approach as a filmmaker. Predominately a series of portraits made in lush outdoor settings in the villages, the photographs are startling in their quietude and peacefulness. More than a study in the harsh aspects of rural poverty, the persistence of folkways among the older generations, and the changes brought by the villages’ increasing dependence on remittances from the U.S.––all of which are visible in varying degrees–– Salzmann’s photographs show us a glimpse of the fortitude and endurance that rural Mexicans have developed over generations. In this sense, Salzmann’s picture is not the predictable one of a traditional world shattered by modernity, but of an old world already built of resiliences and adaptiveness, prepared for the losses of the NAFTA era. It would have been enough if Salzmann, an internationalist and a xenophile, had only showed American audiences what the Mexican countryside actually looks like––its houses, workshops, businesses, farms. It would have been enough if Salzmann had showed what Mexican cultural pride looks like––labors, weddings, celebrations, communal work events, gambling contests, first communions. But Salzmann has gone well beyond these things in his commitment to the ethics of meeting others, and treating others as fellows––not with self-righteousness or liberal moralism, but with a powerful modesty and a penetrating large-heartedness to match that of his subjects. Laurence Salzmann knows how to link peoples through images, and Echele Ganas is a work of his accumulated wisdom and compassion. Jason Francisco is a photographer, critic and essayist. He is the author of Far from Zion: Jews, Diaspora, Memory (Stanford University Press, 2006), The Steerage and Alfred Stieglitz, co-authored with Anne McCauley (University of California Press, 2012), as well as numerous essays, reviews, and photoworks. He is associate professor in photography and visual culture at Emory University, and lecturer at Stanford University. More information on his work is available at his website, www.jasonfrancisco.net.